As I mentioned a couple days ago in the comments, The Hidden Cameras live are one of the greatest things I’ve ever seen (yes, my hyperbole engine is enabled), but the albums don’t reach the same heights for me for a variety of reasons, including how they simply don’t capture the magic of the live performance, and with their “In The Boneyard” collaboration with the Toronto Dance Theatre, the bar is set even higher. Zoilus and Geekent have much better reviews than I (in addition to the The Toronto Star and The Globe & Mail ones I linked yesterday), but I, however, have pictures. Only a handful, taken very quickly during the last two numbers when the audience was up and clapping and generally carrying on. It wasn’t really the sort of atmosphere that I wanted to have the camera out in, and I really didn’t want to miss anything happening onstage whilst fiddling with the settings. And anyway, still photos don’t really do the show justice – it was so kinetic, you’d need video and even then, it couldn’t capture the live experience (though if any one of the pieces was recorded, it would easily be one of the best music videos ever). The Cameras were set up on a high set of scaffolding while the dancers frolicked on the stage in front of them (and invaded the audience a couple times). Over the course of the show, the dancers and musicians would change places and try their hands at the others’ craft (and usually acquitting themselves decently). I’ve never watched modern dance before, so I was really awestruck watching the dancers move – they were so graceful and nimble, I felt horribly clumsy and awkward just sitting in my seat. The production felt like a Broadway show, but without all the unnecessary story and dialogue – it was just a solid hour of enormously entertaining and joyous music and dance. The Cameras’ new Awoo material, which soundtracked the show, sounded good, though very much the same as the older stuff. It will be interesting to try and enjoy the album on its own when it comes out next year – I’m sure I will, but it really worked so well with the dance, it’s really a shame they couldn’t somehow capture that energy and spirit for all to experience. But until they do, I guess I’ll just have to say “you had to be there”, and if they do this again next year, which I hope they do, then you really should try. Apparently five sold-out shows just ain’t enough. Stars have achieved maximum rock’n’roll density with an all-ages matinee show at Lee’s Palace on Sunday, December 18. So for those keeping track, that’s shows on the Thursday, Friday, Saturday afternoon, Saturday night, Sunday afternoon and Sunday night. Whoo. Jeff Tweedy talks to Paste about Kicking Television, “Kicking Television” and what lays ahead for Wilco. Billboard has details on RT – The Life and Music of Richard Thompson, the Richard Thompson box set due on February 7 of next year. Glide celebrates the resurrected Posies. Chart talks to M83 in an old interview that they’re running for no real good reason. Sufjan Stevens’ Illinois came out on double vinyl this week, and features a bonus track (“The Avalanche”) and third iteration of the cover art featuring some brightly-colour balloons in that infamous central piece of real estate (because nothing says “Illinois” more than balloons). But! The first 500 5000 copies (though probably all snatched up via pre-order) have those balloons on a “Peel slowly and see”-approved sticker… and guess what’s underneath? Up up and away. Cheeky monkeys. I’ve been nominated for “Best Culture Blog” in the Canadian Blog Awards. Well, me and about 4000 other blogs. Democracy in action and all that. Goldenfiddle reports that Dean & Britta (that’s Wareham & Phillips, ex-Luna), have been tapped to provide the soundtrack to the forthcoming film Just Like The Son, which will be directed by Morgan Freeman. 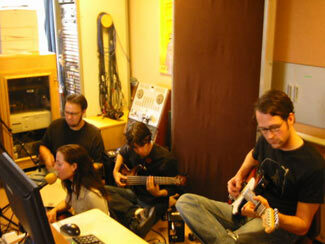 They also currently have a couple songs on the soundtrack for The Squid & The Whale, which they also scored. I tried to see a couple weeks ago but was foiled by my inability to correctly read the show time. Curses. The AV Club has an interview with director Noah Baumbach, who has a history of being a Luna fan – the band contributed to the soundtrack for his last film, Mr Jealousy. Tangentially – Poptones poses Questions of Doom to D&B collaborator and houseguest Sonic Boom. December 14 will see the 2nd annual Holiday Jam benefit for the Hospital For Sick Kids take place at the Phoenix Concert Theatre. It’ll be a smorgasborg of rootsy singer-songwriters, with a bill featuring Sam Roberts, Sarah Harmer, Kathleen Edwards, Danny Michel and Matt Mays. Anyone want to lay odds on a big, everyone-on-stage love-in finale? Tickets are $35 and go on sale Friday. Also on December 14 – The Mendoza Line, whose Full Of Light And Full Of Fire just got a glowing review from Popmatters (and are doing pretty well overall) will be at the Rivoli with Great Lake Swimmers and Picastro. What a great bill. I thought my 2005 concert year was done, but not quite yet. And coincidentally, The AC Club has a combo review of the Mendoza and GLS albums (okay, not so coincidentally, they’re labelmates). The Nada Surf show at Lee’s Palace on March 11 just got an extra boost in the bill – also along for the tour will be Rogue Wave, so if you don’t get to see them at the Horseshoe this Sunday (or if you’re so blown away you have to see them again), you’ll get another shot in three months or so. The Toronto show will be last one of the monht-long tour, so they’ll either have a little extra to give or nothing at all. Rogue Wave are also featured in the Torontoist week in ever-decreasing number of shows and are interviewed in NOW, Pulse Of The Twin Cities and The Georgia Straight. 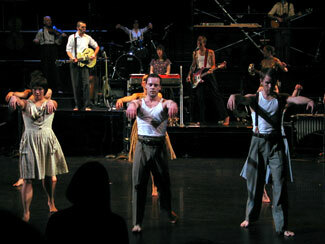 I will have my review of the Hidden Cameras/Toronto Dance Theatre show up tomorrow. Sneak preview? AWESOME. In the meantime, you can read The Toronto Star‘s and The Globe & Mail‘s take on the opening night show. It’s a freaking nationlism epidemic. Take Your Medicine presents the 47 hottest bands in the UK. I wait with bated breath for the inevitable “hottest bands in Uganda” post. Catbirdseat is the first on my blogroll to make with the best-of 2005 list, My Old Kentucky Blog and Gorilla Vs Bear a close second. and third. And since I’m not burned out on peoples’ lists yest, I will make with the linkage. Following up on the brilliant shitstorm success of Information Leafblower’s “Top 40 Bands In America” poll, Matthew over at I Heart Music thought it’d be splendid idea to conduct a similar poll, but of the best acts rocking the Canadian passport – and here are the results. I’m looking at the discrepencies between my list below and the final standings, and am trying to figure out the disconnect. First, I think I was still operating on Leafblower’s more subjective “favourite acts of the year” criteria rather than Matthew’s more objective, “acts that were hot in 2005”. For example – even though I haven’t fallen under their thrall yet, I’d be an idiot to deny that Wolf Parade were hot this year. But I (mostly) stand by my picks, though I sort of wish – as I did for Leafblower’s list – that I actually gave more thought to my selections. Maybe for next year I’ll actually think about this more than an hour before sending my list off. But anyway, here’s the list, followed by some rationales, followed by some more contemplation. Broken Social Scene responded to huge expectations by releasing an album confounding, initially impenetrable but still inexplicably engaging. It started as a grower and it hasn’t stopped. It’s like kudzu. Related – Pitchfork talks to the Broken Social brain trust, aka Kevin Drew, Brendan Canning and Dave Newfeld. Though Twin Cinema seemed to put off some people, it’s the album that really made me love the New Pornographers. All-out pop is great, but the fact that they were able to make something as beautiful and downbeat as “The Bleeding Heart Show” put them in another league completely, as far as I’m concerned. I still listen to Feist’s Let It Die. A lot. And her Canada Day show this Summer? One of the best nights ever. Cha Cha Charming has an interview (via For The Records). I’m inclined to agree with the esteemed Mr Wherry in saying that Stars have the potential to out-sell both Arcade Fire and BSS – and to do it, they wouldn’t have to change a single blessed thing. Sublime pop with just a hint of teeth. Baby teeth, but teeth nonetheless. At SxSW, they were one of the acts that everyone I met was talking about. I’m going to admit something here – I slotted Metric in here without a) having heard Live It Out or b) having seen them live in over two years. Their rank was based mainly on past accomplishments and expectation of a constant upward trajectory. Well I got their new album this past weekend and am thinking maybe I expected a little much. Live It Out goes a little too hard for the throat and occasionally stumbles on the way, but it’s not bad at all… But I’m sure their live show still kicks – and speaking of which, they’ve just announced a show at the Kool Haus on February 24. Tickets $22.50, on sale Saturday at 10AM, presale today. 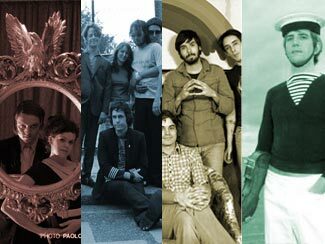 I’m surprised that Arcade Fire topped the list overall – I didn’t consider rereleasing the EP to be all that big a deal and while yeah, the live show still astounds, for me 2005 was a less AF-saturated year than the last four months of 2004, and it’ll surely get taken up a few dozen notches next year when the sophomore album comes out. See, I’m just thinking relatively. Neil Young just turned 60 a couple weeks ago, and dammit, listen to On The Beach and I defy you to give me one reason he shouldn’t be number one on this list, no matter what the year. The Hidden Cameras are a bit of a left field pick for me, as I’m not really that big a fan, but I’m going to see their “In The Boneyard” show with the Toronto Dance Theatre tonight at Harbourfront, and I suspect that I’ll be converted after that. My last two picks are local Toronto acts which, while they don’t have too much profile yet, actually caught my ear, and for whatever reason there’s not too many local up-and-coming acts that do that. While not as groundbreaking as the bands that did make the list, they make the sort of music that the nostalgist in me wishes people still made (C86 indie pop and space rock, respectively) and probably live just down the street from me. Getting back to the list now, I’m seeing a lot of acts there I’ve never heard (or even heard of) while other am familiar with and happily stand by my excluding them. But it did get me thinking – it’s undeniably a unique and exciting time for Canadian music, and I’ll be the first to admit that I’ve been neglecting some of the homegrown talent on account of pressing my nose up against the window of the neighbours’ houses. In my defense, I find there’s a definite trend in Canadian music that leans a little too much to the arty or ironic for my personal tastes, but it’s probable that’s making me overly prejudiced when it comes to stuff spawned locally. And so, that is something I aim to remedy in the new year with – get ready for it – increased Chromewaves Can-Con! Yay. Ideally I’ll be able to do this without letting great music from beyond borders slip under my radar. How? Sleep even less. Great. It’s often been said (well, mostly by me) that logistics are right up there with “creative differences” for being a band’s undoing. Someone has to work when rehearsals are scheduled, someone moves away, that sort of thing. Unavoidable, right? Not for The Earlies. 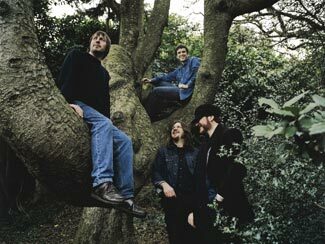 Half their members reside in west Texas, the others in Northern England and they had recorded and released several singles worth of material before even meeting for the first time in 2004. Their first five releases are compiled on the critically well-received These Are The Earlies, and to their credit, it’s a surprisingly cohesive collection. It sounds like the dreamy psychedelia you’d expect from Mercury Rev or The Flaming Lips blended with wispy Beach Boys-ish harmonies and Morr-approved electronic flourishes. The ingredients are all quite agreeable but the hooks of the final product are a little too ephemeral to really catch my ear. I’ll be very curious to see what they come up with when they start thinking in terms of a proper album rather than singles and EPs. The band are currently on tour in North America and will stop in Toronto at the El Mocambo on December 12, towards the end of the schedule. And, if this review is any indication, that’s probably for the best – sounds like they’ll need a little time to figure out this whole playing together on the same continent thing. Joel Gibb of The Hidden Cameras tells Chart how excited he is about “In The Boneyard”, this year’s collaboration with The Toronto Dance Theatre. The five-night stand begins tonight at the Premier Dance Theatre down at Harbourfront. My old school rag (which I used to write for many moons ago), Imprint, also has an interview with Gibb and last week’s eye also got a couple quotes. Idlewild have left their label. Probably a wise move since EMI never seemed to have the slightest idea how to promote them, but I don’t suppose this bodes well for any sort of North American tour next year. It seems like everyone wants to recognize the artists they consider under-recognized these days. There was the now-defunct Shortlist of Music, the from-the-ashes-of-Shortlist New Pantheon prize and what is now the old boy on the block, The Plug Awards (which debuted last year). It boasts a pretty impressive advisory panel as well as a pleasantly proletarian attitude – winners will be voted on by the hoi polloi right here. Nice, though I can’t help but notice they misspelled “chromewaves.net” no less than twelve separate times in their “best music website” category. Tsk tsk. Spacejunk has links to a bunch of recently released, indie kid-friendly music videos – and there’s even Canadian content! I can’t be bothered to itemize them all, so just click on over and see for yourself. So I’ve been doing the iPod thing for a while now, that’s going well, but I’m ready to dip my toes into the world of iTunes this week – assuming that the releases I want are going to be available in Canada. Now while I still have no interest in buying a regular album in electronic format when I can buy the physical media, their exclusive iTunes sessions do have my interest. Case in point – this Tuesday will see the release of the David Bowie/Arcade Fire single recorded at the Fashion Cares thingee this past September. I’ve heard the mp3s circulating online, but hope that the “official” release has a better mix. It came out in the UK last week but is slated for release over here tomorrow. There’s also an iTunes-exclusive live EP from Trespassers William out tomorrow, featuring two songs from the forthcoming Having (out February 28), “Weakening” and “Ledge”, and two from their last album, Different Stars (“Lie In The Sound” and “Love You More”). And looking ahead to next month, there’s that Belle & Sebastian live performance of If You’re Feeling Sinister in London this past September which goes on sale December 6. Again, I hope that there aren’t territory exclusives to this stuff – I’m perfectly happy to shell out for these tracks if given the opportunity. And it figures that just as I’m prepared to dip my foot in the water, they’re talking about variable pricing for downloads – Coolfer reports. I wonder if Canadian prices will remain lockstep with the US? With the exchange rate, Canuck iTunes is actually cheaper than the Yankee version. I like that. The Bangkok Post talks to Peter Svensson of The Cardigans about Super Extra Gravity. I got a copy of this on Monday, and while I was initially a little disappointed that there’s nothing else as instantly awesome as the first single “I Need Some Fine Wine…”, their promise of a more eclectic album actually does hold true. Compared to the polished alt.country style of Long Gone Before Daylight, SEG is all over the map but the melancholy undercurrent remains. Think of it as the downbeat cousin to First Band On The Moon. It took me a little while, but I’m liking it now. The Guardian talks to the #1 artist in America, Sufjan Stevens. Illinois has sold over 100,000 copies? Holy smoke. Gemma Hayes talkst to Billboard about making The Roads Don’t Love You, which will get a North American release next Spring, probably May. While that’s a longer delay than I’d like, I will still wait for the domestic issue. I want to hear the album, but not $30 worth of badly. Bradley’s Almanac has photos and a complete recording of American Analog Set’s final Boston show last Wednesday. New York Magazine talks to Brian K Vaughan about Ex Machina. Robocop will be joining the cast of 24 next season! Peter Weller will play Jack Bauer’s mentor while Julian Sands will step into the role of villain Vladamir Bierko – I guess it’s time for the villain pendulum to swing back to Euro-trash. Also new will be everyone’s fattest hobbit Sean Astin as a new addition to the CTU staff (presumably as the donut delivery boy). More details at StarPulse. Season five kicks off with four hours over two nights, starting January 15 and 16. Odd question – I saw a pretty significant traffic spike this weekend for no reason I can identify. Um, was there a print media mention somewhere or something? Just curious.